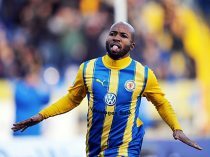 Dominick Kumbela stole the show from African stars across Europe at the weekend with a hat-trick for German strugglers Eintracht Braunschweig. Egypt’s chances of reaching the 2014 African Women’s Championship (AWC) suffered a major blow after losing 0-3 to Tunisia on Sunday in Cairo. TANZANIA has climbed two steps higher in the latest FIFA world rankings and is now placed 116th in the global chart. The journey to the 9th African Women’s Championship (AWC) Namibia 2014 begins this weekend with the first leg matches of the first round. Not many would have predicted the result that came from Somhlolo Stadium at the weekend when Mbabane Swallows hosted their more erstwhile Zambian opponents, Nkana FC in the first leg preliminary round of 2014 Orange CAF Champions League.